This quick pasta recipe is easy to throw together and so tasty that the little ones won't even mind they're eating the superfood that is broccoli! As a vegetable, broccoli is one of the healthiest, full of nutrients and containing very high amounts of Vitamin C. Its lovely bright green colour is thanks to the phytochemicals in it that provide a boost to the immune system. 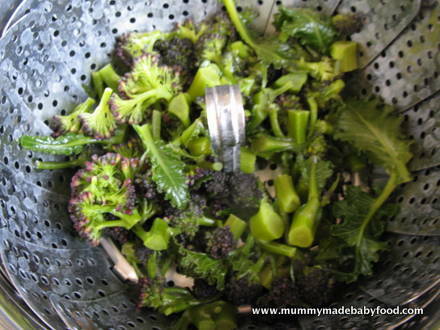 My boys love broccoli, especially when it's been lightly steamed to bring out a subtle sweet flavour. For this recipe, you can use ordinary broccoli, or even tender stem broccoli (broccolini), but I prefer to use purple sprouting broccoli when it's in season in late winter / early spring. It's got such a beautiful deep colour, which comes from the extra beta carotene and Vitamin C - not to mention iron and folic acid - and sweet little leaves (which are edible) along its long slender stem. And it certainly livens up the meal, as the little ones find it hilarious eating purple broccoli (because everyone knows that broccoli is supposed to be green)! 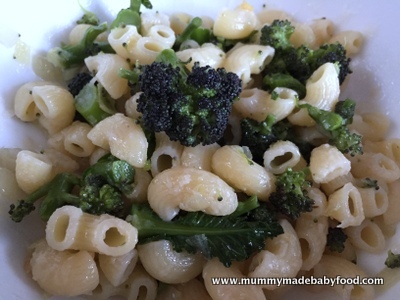 If you have a smaller baby just starting out on solid food, you could use soup pasta or smaller pasta shapes and chop the broccoli quite finely for easy spooning. 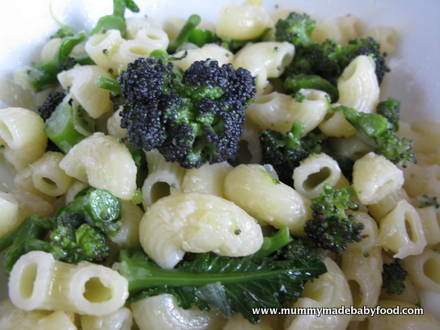 Or choose larger pasta shapes, and leave the broccoli in bigger chunks for easier handling, if you're following the baby led weaning approach. The real key to making this recipe work is to not overcook the broccoli, so that you keep as much of the original nutrients in tact as possible. You can also feel free to add different vegetables to the mix, or change out the vegetable altogether, depending on what your baby likes. When you see how easy it is to cook and vary, this quick pasta recipe will also form part of your core repertoire of child friendly meals! The recipe below yields approximately two child sized servings but is easy to scale up, if cooking for the entire family. Steam the broccoli for two minutes, or until softened but still with a bit of bite to it. Set aside. Next cook the pasta in a saucepan according to packet instructions. Drain and return to the pan. Whilst the pasta is cooking, heat some oil in a frying pan. Cook the onion and garlic gently for a few minutes, until the onion is soft and slightly translucent. Add the onion and garlic to the saucepan with the pasta. Then add the broccoli and mix well until combined. 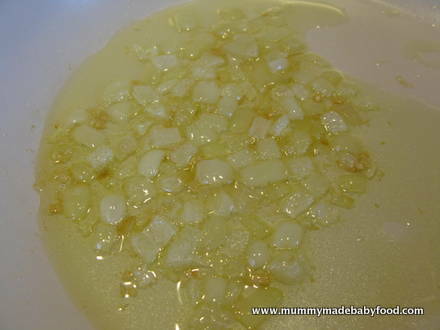 Add a touch more olive oil, if desired, then serve with freshly grated Parmesan on top.